Arutz Sheva radio host's poignant new book memorializing the 6 million Jewish Holocaust victims has caught international attention. Page from "And Every Single One Was Someone"
A newly released book seeks to memorialize the six million Jewish victims of the holocaust in a uniquely powerful way. 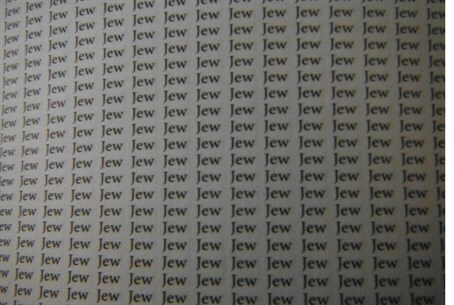 Entitled And Every Single One Was Someone, the book consists of just one word, printed six million times: "Jew". The book was developed by Arutz Sheva show host Phil Chernofsky, who serves at educational director of the Orthodox Union's OU Israel Center and editor of Torah Tidbits. "Six million is a number that a human being cannot possible wrap their minds around," Chernofsky told Arutz Sheva news. "It's supposed to make you stop and think," he stated. Aside from the introduction, the 1,250-page hardcover volume only has one word. The book has elicited positive reviews in the New York Times and other international media outlets. Upon making aliyah to Israel, Chernofsky continued the exercise, keeping a binder of the pages. "When Ilan Greenfield from Gefen Publishing House saw it, he insisted that he had to publish it," Chernofsky relates. The real boost came about two and a half weeks ago when the New York Times published an article about the book on the front cover of their Sunday Times edition. "I've gotten a lot of praise and some criticism too," says Chernofsky. But one particular piece of feedback seems to have hit home. "I received an email from a fellow that lives in Jerusalem whose parents were born and raised in Germany. "In 1939, they managed to escape to France only to find themselves in Nazi occupied part of France. They managed a second escape to the free part of France to where they escaped to freedom. But his grandparents tried to the same escape route and were caught and sent to a detention camp in Paris and from there to a transport to Auschwitz. "And this fellow wrote, 'there are thousands of books on the Shoah, and yours is the first one that mentions my Oma and Opa. I think of them often, and I thank you for remembering them also.'" Phil Chernofsky is the host of Torah Tidbits Audio. For podcast archives click here.